I started thinking about his quilt right after Thanksgiving, and went through my fabric stash to pick out all the ‘guy’ fabrics. 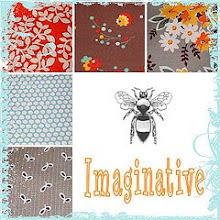 I selected fabrics in shades of green, orange and blues (nothing with flowers!). Then those fabrics sat in a pile for a couple weeks while I tried to think of a pattern to use. I used the orange Amy Butler striped fabric for the majority of the binding, and also pieced in a few other prints from the quilt top because I really do love a pieced binding. 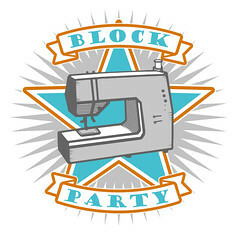 This entry was posted in [search] Other Quilts, 2008 Finished Quilts, Finished Quilts, Household Sewing - bags, napkins, pillows, Posts about Quilts, Quilts and tagged Amy Butler, Fabric, free motion, handmade, manly, quilt, quilting. Bookmark the permalink. 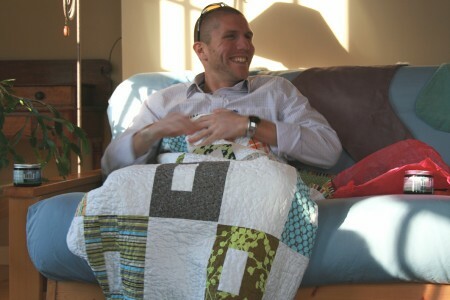 Okay, first, I love that quilt. Second, that arrow is too funny. Totally makes it. Such a fantastic idea! Nice work. 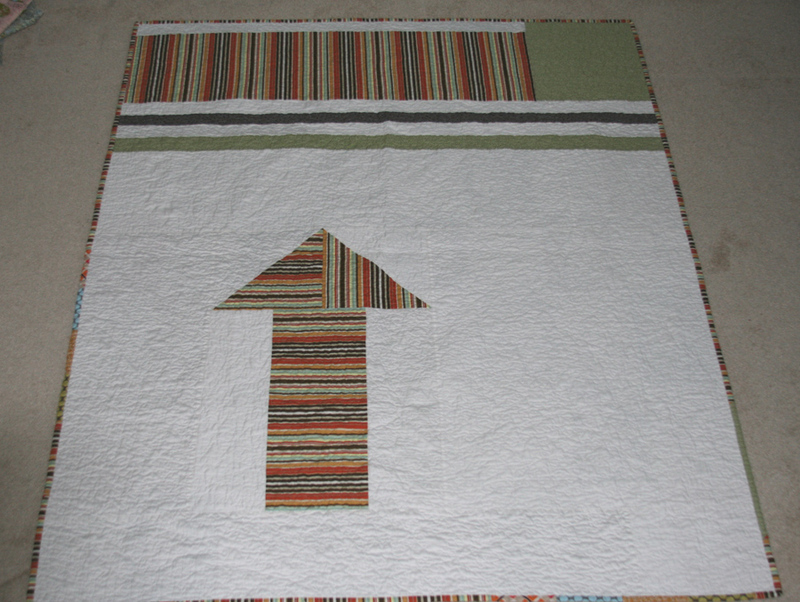 that’s the best quilt back i’ve ever seen…and so thoughtful of you too! What a great idea! I DO think he has a point there and I just wish now that you hadn’t brought it up!!! What a sweet and funny gift! I think it’s perfect. That is the cutest Christmas story I have read all week!! What a great sister you are. 🙂 🙂 May I ask what pattern you used for this or can you put a tutorial up for it? 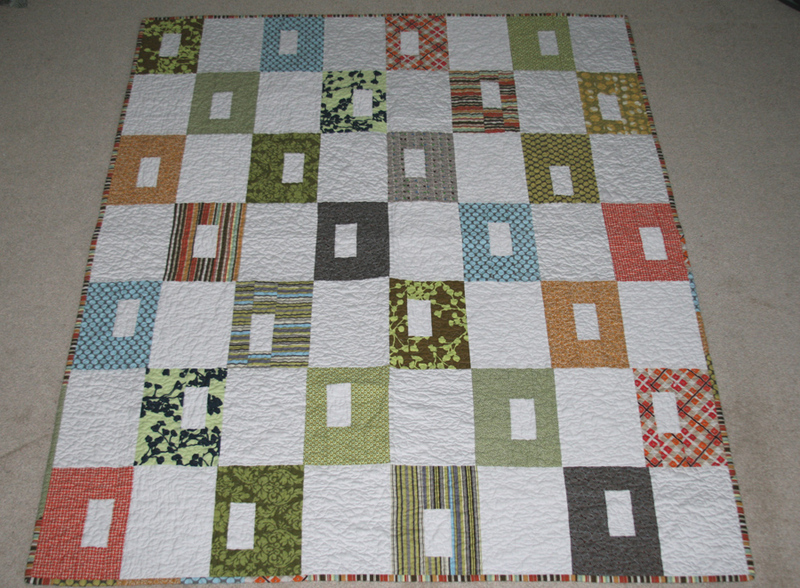 I have been wanting to make this quilt for a while now. What a great quilt. Very manly. I love the backing. Such a cute idea. He looks like he really likes it. It is a wonderful quilt! And too funny. I love the back – it was a great idea and came out great. 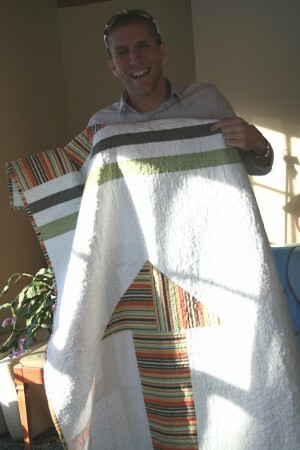 Funny, I need to make 2 men quilts and that one would be perfect! Your brother seems to love it! can you share the pattern name and source please? oh, that’s beautiful. what a great quilt! and personalized to just fit your brother’s needs. i think the arrow is a fabulous idea ^^. Oh it’s great!! 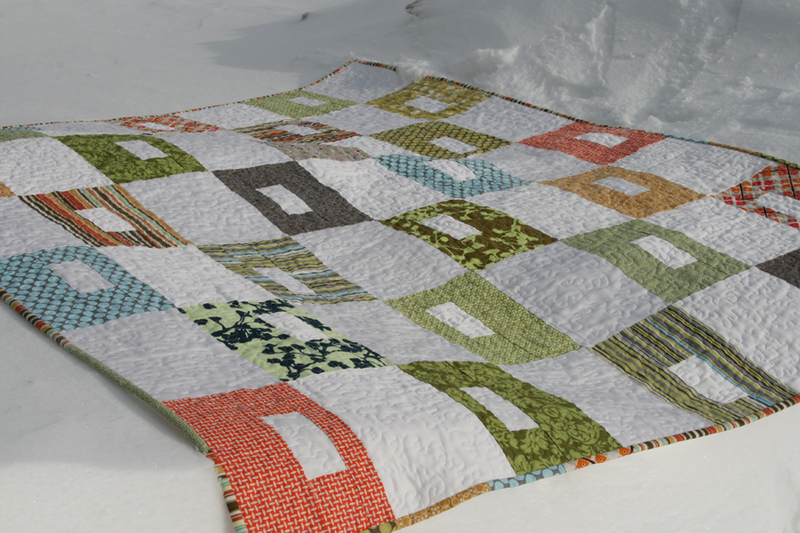 I find it’s so rare that quilts are made for men, so I love to them one that is. It’s wonderful! And the back is GREAT. that’s hilarious, and so creative of you to think of the arrow. i love it. That is SUPER funny. Great quilt. The arrow is hilarious! LOL I love it! Looks like your brother loved the quilt. Your brother sounds a lot like one of my friends – great job on the up arrow, my friend would appreciate that! 🙂 I’m sort of surprised the offset rectangles don’t bother him on some level… But the quilt itself is wonderful, great work! I love it! the arrow is too funny! Great story and really fun personalized quilt! This is so great – I love the arrow. And his reasoning does make sense! That is hilarious. I hope he really likes it! I love, love the arrow. I love the expression on your brother’s face! I’d say he likes his new quilt. Great job with this one made for a guy. how funny! I love the arrow. I’d say he definately has OCD. That is way too funny!! He look as though he loved it…hahahah!! I love it! Very very clever! i. love. this. quilt. the front is oh-so-perfect. and the back is hilarious. such a great personal touch. lol – love the arrow 🙂 The top is beautiful – in a manly way! I just love this quilt! I came across it on flicker and love the white combined with the colors. I am the same way with my feet and a blanket, love the arrow. Happy New Year! Ahahaha! The arrow is priceless! I love a quilt with a sense of humor. Awesome! The back is even better than the front! handsome guy i might add. I always mark the top of the quilt with a wider strip of fabric (wider border) at the top….i don’t want my head where my feet were either!!!! This is so funny. That sounds like an issue my husband would have. Like he has to have separate clippers for fingernails and toenails, and he thinks I’m disgusting because I don’t. I’m like, can’t you just wash your hands after? But, no. No you can’t. Also, my shoes aren’t allowed in our closet because I don’t decontaminate them with every use with shoe spray. So, he’d probably love this quilt idea!